Τοποθετημένο στην υπέροχη περιοχή της Ασακουσα, το Kangaroo Hotel Side B χαίρει μιας επιβλητικής θέσης στη πολιτισμικά αξιοθέατα, περιήγηση σε αξιοθέατα, ψώνια κεντρικό σημείο της Τόκιο. Από εδώ, οι επισκέπτες μπορούν να έχουν άμεση πρόσβαση σε όλα όσα η πόλη έχει να προσφέρει. Με την βολική του τοποθεσία, το ξενοδοχείο προσφέρει εύκολη πρόσβαση στους προορισμούς της πόλης που πρέπει οπωσδήποτε να δείτε. Το Kangaroo Hotel Side B προσφέρει άψογη εξυπηρέτηση και όλες τις βασικές ανέσεις στους ενθουσιώδεις ταξιδιώτες. Το ξενοδοχείο σας προσφέρει μια μεγάλη επιλογή υπηρεσιών, συμπεριλαμβανομένων των δωρεάν WiFi σε όλα τα δωμάτια, αυτόματο πλυντήριο, ασύρματη σύνδεση Wi-Fi σε δημόσιους χώρους, μηχάνημα αυτόματης πώλησης, ενοικίαση ποδηλάτων. Επιπλέον, όλα τα δωμάτια διαθέτουν ποικιλία ανέσεων. Πολλά από αυτά παρέχουν ακόμη και επίπεδη τηλεόραση, κρεμάστρα ρούχων, καθρέφτης, παντόφλες, πετσέτες προκειμένου να ευχαριστήσουν ακόμα και τον πιο απαιτητικό επισκέπτη. Εξάλλου, το ξενοδοχείο διοργανώνει πολλά ψυχαγωγικά δρώμενα έτσι ώστε να έχετε πολλά πράγματα να κάνετε κατά τη διαμονή σας. Όποιος κι αν είναι ο σκοπός της επίσκεψης σας, το Kangaroo Hotel Side B είναι μια εξαιρετική επιλογή για την διαμονή σας στη Τόκιο. Reception is open until 10:00 PM. Οι επισκέπτες που καταφθάνουν μετά τις 09:00 PM πρέπει να επικοινωνήσουν απευθείας με την ιδιοκτησία πριν από την άφιξη. One child under 6 years old stays for free if using existing bed. Any additional child under 6 years old will be charged JPY 2,000 per child per night. Nothing is good in this hotel. If u want to stay here, make sure u are willing to walk so far from the station and willing to carry ur luggage coz they dont have an elevator. Their towel is so small and u have to pay for a bigger towel. One thing I appreciate is they left the key when we arrived late at night. Although the rooms are on the small side with little room for your luggage they are very clean and comfortable. Nearest station is 15 minute walk away, staff are friendly. There is boiling water, drinking water and a microwave available to use if you want to eat in, however no bowls, glasses or cutlery provided which is a bit of s shame. Despite this we would stay here again when we return to Tokyo. The place is very nice and quite convenient with a few supermarkets nearby. On the way to check in was quite difficult since the distance from subway to the hotel is quite far. Overall stay is very nice though. The room is a bit small, but cosy enough for 1 person. Facility is well cleaned. Will definitely come back again next year. 1. This hotel is chic and livable. 2. The room is not big enough but u can find almost everything u need for a good stay. 3. The area is great. It's really quiet in the night and only takes a few walks to the Metro and bus station. 4. The staffs are super friendly and helpful. We stayed here for 3 nights. Hostel has washing machine and dryer but never had the chance to use it because of our limited time in the hotel after our daily tour. Place has a common bathrooms, toilets and one bath tub. Nice thing is they have free hot water and free use of microwave oven which is convenient if you’re planning to buy something from Supermarket. Room has mini ref also. Only comment I have is that the towel is also Mini compared to our other accommodation. Better to bring your own towel instead. This place offers a quiet neighbourhood and like a little over 1KM walk to the nearest station. It was a great deal for 36 bucks a night, 1 room for 2 people.. It was a small room for 2 people but it served its purpose. About a 10-15 minute walk to the nearest train station. The convenience store was a 7 minute walk and a grocery store was just around the corner. If you have a lot of luggage, this place is not meant for you. The room is small. I stayed for 2 weeks with my 17 year old son and luckily we only had one suitcase each. They have a washing machine and dryer on site but I would recommend not to use the dryer. It didn't dry the clothes well after 2 cycles. There is a coin laundry mat about 2 blocks away that costs the same as the hotel. This place is more like a room stay then a hotel stay. The place is clean and the staff are friendly. The stairs are a killer if you're on the 3rd floor and you come back from a long day of site seeing. But other than that, I enjoyed my stay here. traveller with young children should avoid this hotel. front desk staff often not at the desk. we arrived at 3pm plus and the staff nowhere to be found, and have to wait for 1 hour, then the staffs came house. we wasted 1 hour for waiting despite we are rushing to Fukiage after check in. hotel just fit for 2 person in a room and no lift, staircase so small and those with big luggage will definitely have difficulty to bring the luggage up and put in the room. not very near to train station. This hotel was basically exactly what I was looking for--that is, it had a door to my room for a cheap price. I was pleasantly surprised, though, because everything was fairly comfortable. The location is good if you want to experience a side of Tokyo that many travelers might not, but it is a bit far from any major stations, although the closest subway line (Hibiya) is a useful one. My only complaint would be the difficult-to-access outlets; I had to struggle to plug my phone in behind the refrigerator. My boyfriend and I extended a layover in Tokyo to get to explore the city but we were looking for a cheap option. We had a private double bed room, great AC, bed just a mattress on the floor but still comfortable. Room was very small but not a problem since we only used the room to sleep. Location is in a nice quiet neighbourhood, about a 25 min walk from main subway line. Definitely not super convienant but we still enjoyed our stay and it was exactly what we hoping for for the great price. Very nice stay at this hostel! It's a bit out of the way going to Sensoji, but if you don't mind the 20-25 minute walk it is quite nice. The neighborhood itself is quiet and feels very safe, even late at night. Nearest station is Minami senju, about 10-15 minutes (you can take Hibiya line to Tsukiji). To Asakusa Station, about 20-30 minutes. Kangaroo Hostel is very clean and has a nice, trendy and modern atmosphere to it. 2 showers, 1 bath, and 1 toilet for each gender on the second floor, never had to wait. However, the rooms are very cramped. My friends and I didn't mind, but if you're the type to need a lot of room, then you might want to find another space. The 3 of us stayed in a tiny room and only about one or two people could unpack luggage at a time. But, there is space underneath the bed and if you're 5 foot 6 inches or shorter, the bed can fit small bags (think carry on bag for airplane) at the end of the bed. But be warned; there's only one outlet with only so many places to plug. There is enough for about 3 - 4 things that can be charged such as iphone or laptop, etc. Staff is very friendly and you can keep your luggage there if you come too early or need somewhere to put while shopping after checking out. Overall great stay! The hotel is not far away from different tourist spots. Just around 15-20 minutes bus/ 25-30 minutes walking time could arrive different spots. However, the environment is quiet and comfortable. 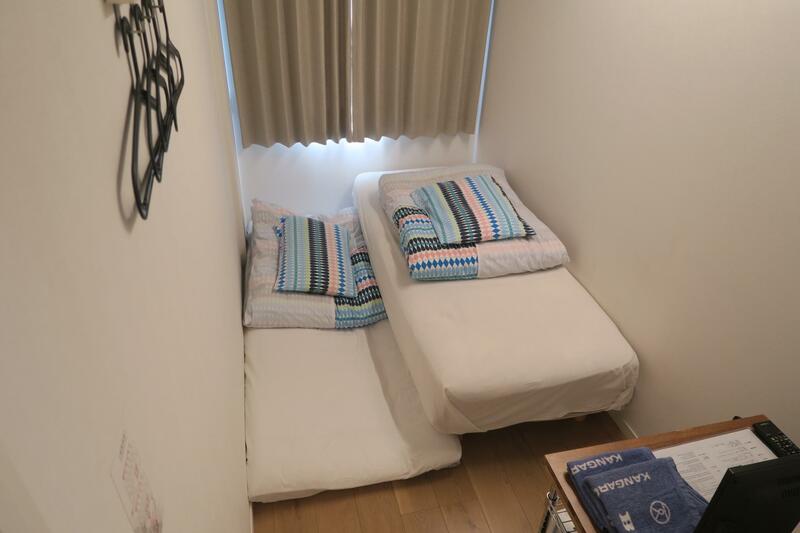 Even though it's a small room, it's enough space for solo travelers to stay. And the staff there have really great service and politeness. The only problem is the reception opens at 09:30, if you want to drop your luggage before check-in, you have to notice this information. The staff is very good in English. It a little bit far from subway about 800m. So You need to do a bit homework before the day you reach. But if you try to use Google Map they can help a lot. The room are tiny but safe and clean esspecially sharing bathroom. Im impressed. Thank you. I had a great time staying at this hotel. They provided me with what I need, a clean room, clean pillow, clean bed, clean bathroom and clean toilet. The location is not on the main road so I had a hard time locating it, but don't worry Japanese are very helpful. You can ask people in the neighborhood especially those at the convenience stores nearby, they are very much willing to help. I accidentally found the hotel and the booking is fast as we travel fro a short business trip in Tokyo, the hotel is about 10 mins far from minami-senju JR. but very easy to walk. There are supermarket and convenient store along the way. The room is so tiny but clean and have everything we need, even have hair dyer in the room. The problem is the garbage at the end of walk way is smell at the end of day, other than that it's a great stay. It was a good experience staying in Kagaroo Hotel side B. The staffs are friendly and very helpful. They tell me how to take the bus to station that I don't need to walk for long distance. They also help me to keep my luggages. 15mins walk from the nearest subway station, 4 supermarkets and 1 convenience store around the area, great for last min shopping for snacks. The room wasn't big but sufficient enough for a solo traveler. Rather inconvenient that the shower room is located at Level 2 and the laundry room is located at the main building. A small police station could be found, but in an opinion of a female traveler, the district is way too quiet at night and I felt abit uncomfortable walking on the streets. However, the nearest subway station is a few stops away from Ueno Station, which could easily transfer to the Keisei Line for Narita Airport. Σιδηροδρομικός Σταθμός Minami Senju στα 0.75 χλμ.